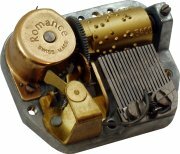 A high quality clockwork wound 'Romance' musical movement with an 18 note comb made by Reuge in Switzerland. Very nice tone, ideal for jewellery boxes. Complete with winding key & wire brake fitted. For more information on the musical movements, please click here. A selection of tunes are available to choose from when ordering below. To hear tune samples, click here. Do you need any extras ? click here for more information.